As the Bobolinks begin to arrive in New England fields, we are busily finalizing contracts with farmers participating in The Bobolink Project. 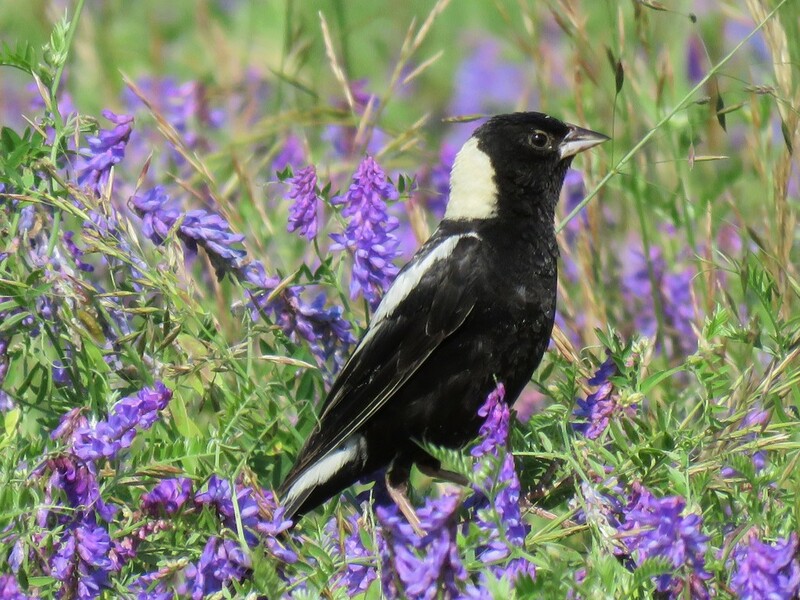 Thanks to the generosity of Bobolink Project supporters, we raised enough money to protect over 500 acres of farmland in New England this summer! This money will allow farmers to adjust their haying schedule for the benefit of grassland nesting birds. 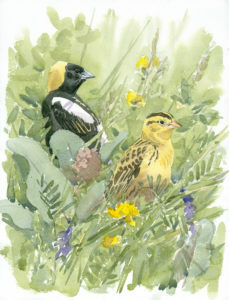 Bobolink Pair at Drumlin Farm, watercolor by Barry Van Dusen, artist in residence for the Museum of American Bird Art at Mass Audubon, 2015-2017. This year the project was so appealing to local farmers that we had more acres offered by interested farmers than we could afford to protect. Sixteen farms are expected to be enrolled in the project this year, located in Vermont, Massachusetts and New York State. 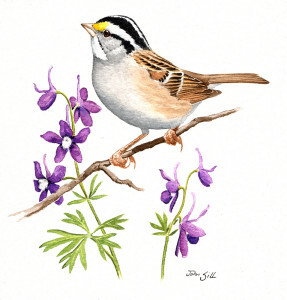 This is the first year The Bobolink Project has been collaboratively coordinated by Mass Audubon Bird Conservation staff with Audubon Vermont and Audubon Connecticut. Read more about the Project’s history and recent administrative transition here. Last year it is estimated that over 500 baby Bobolinks fledged from 500 acres of protected farm land enrolled in the project. Protected fields were also home to other species of declining grassland birds including Eastern Meadowlarks, Savannah Sparrows and Northern Harriers. We look forward to welcoming grassland birds to fields enrolled in the program this summer and sharing our results with you. 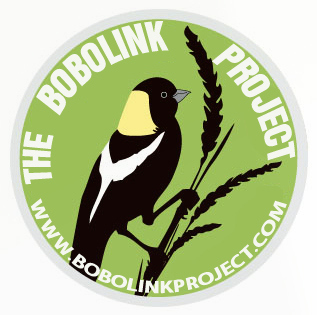 Keep up to date with The Bobolink Project by signing up to the mail-list or follow us on facebook. It is not too late to help declining grassland bird species, if you donate now your money will go towards helping farmers and grassland birds in the summer of 2017. The project received some great press in the lead up to the breeding season, airing on Vermont’s WCAX’s “Across the Fence“. Articles also appeared in Vermont’s Rutland Herald and Times Argus and a recent WCAX story featured one of our landowners from 2015! Check out the video. The Project was publicized at the Connecticut Ornithological Association’s Annual Meeting in Middletown CT, and the Mass Audubon Birders Meeting in Boston MA, and also featured on an episode of Ray Brown’s Talkin’ Birds radio show. This entry was posted in Grassland Birds on May 5, 2016 by Lindall. *Based upon the progression of spring so far this year, it would appear that migration is on track. In fact, a few migrants seem slightly ahead of schedule. This suggests that by Bird-a-thon weekend, most of the expected species should likely be on hand. *High water in many wetlands right now seems to be limiting the location of certain species that are more dependent on lower water levels or muddy edges for foraging. *The prevalence this past winter of many more seabirds in inshore waters off Cape Cod (e.g., alcids) than is often the case suggests that there might be a better chance of finding lingering seabirds during Bird-a-thon this year. Also, sooty shearwaters have already arrived offshore, several weeks ahead of their typical arrival. *From a strategic perspective, play the birding odds (i.e., cover traditionally good birding areas thoroughly), follow last-minute bird reports to take advantage of the known presence of less common species, and tackle varied habitat. *Make sure your team and its supporters recognize the significant effect funds raised as part of Bird-a-thon have on Mass Audubon’s sanctuaries and programs ability to continue their important work. 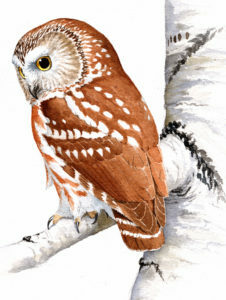 *You or your team should have specific localities in mind to look for less common or seasonally lingering species (e.g., freshwater ducks and sea ducks, red-necked grebe, great cormorant, cattle egret, American coot, purple sandpiper, Wilson’s snipe, northern saw-whet owl, Acadian flycatcher, white-eyed vireo, cliff swallow, golden-crowned kinglet, vesper sparrow). Don’t leave the finding of these species to chance! *Team up your more experienced birders with newer birders to maximize the fun and the effectiveness of the team’s effort! *Be sure to refer to the previously produced Tips for Bird-a-thon Birding and Bird-a-thon Birding in the Rain. Have a Great Day Birding and Appreciate the Miracle of Spring Migration for What it is- Be a Part of Bird-a-thon! Bird-a-thon is Mass Audubon’s annual birding competition and fundraiser where teams of birders spend 24 hours trying to spot the most species of birds in Massachusetts. Bird-a-thon 2016 begins May 13 at 6 p.m.
Join a team: To bird with a team, contact a team captain. Birding rosters are finalized 4 days before the event, so act quickly. Fundraise in honor of your participation by creating an online fundraising page and/or collecting cash and checks. Be a Bird-a-thon Booster: Raise money for your favorite team. No birding required (but some Bird-a-thon Boosters bird for fun!). To fundraise, create an online fundraising page and/or collect cash and checks. Donate: Support a participant, a team, or the event in general. Consider supporting the Bird Conservation Team! This entry was posted in Events on May 4, 2016 by Lindall. One of the top recommendations from our Breeding Bird Atlas 2 and State of the Birds 2013 work was to create more young forest habitat. Birds that breed in young forests, such as the White-throated Sparrow and Eastern Towhee are some of our most steeply declining species. Jeffrey Ritterson, our Forest Bird Conservation Fellow has been working hard to promote support for young forest birds. Jeff has been working on the Foresters for the Birds Program, a partnership between Mass Audubon, the Massachusetts Woodlands Institute and the Department of Conservation and Recreation. The program trains consulting foresters, who create habitat management plans for private landowners, to manage forests for birds. 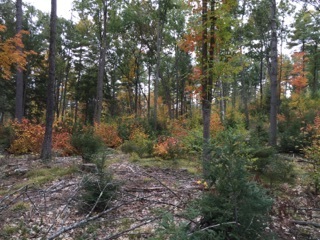 Around 70 % of Massachusetts’ forests are privately owned so the program has the potential to greatly affect the quality of forest habitat in the state. The program is currently focused in areas west of the Connecticut River and Jeff has been busy preparing for the eventual statewide expansion of the program. In addition to training consulting foresters and conducting forest bird habitat assessments on properties, Jeff has been working to update existing outreach materials. These updated ‘how to guides’ will include information specific to forest types and bird assemblages that correspond to regions of Massachusetts. In April Jeff attended the annual Mass Forest Alliance meeting in Holyoke to promote the program. There is a busy summer ahead for the program with many workshops and habitat assessments booked across the state! This entry was posted in Forestry for the Birds on May 2, 2016 by Lindall. Despite their name, Eastern Meadowlarks are not larks, but are members of the blackbird family. These brightly colored blackbirds were once abundant, singing from atop fence-posts and telephone lines near Massachusetts fields. Unfortunately, this sight has become increasingly rare: Eastern Meadowlarks have suffered one of the sharpest declines of any species in Massachusetts. Data from our Breeding Bird Atlas 2, show that this species has disappeared from over 75 percent of its 1979 distribution. Their breeding range in Massachusetts is now very limited. 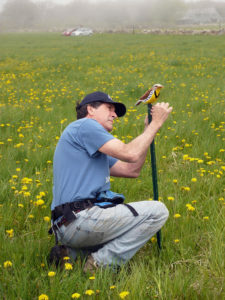 Dr Jon Atwood installing an Eastern Meadowlark decoy, photo by Rosemary Mosco. To take action, Bird Conservation staff are conducting field experiments to see if audio playback and decoys can be used to encourage Eastern Meadowlark to nest on former breeding sites. The use of audio playbacks (playing pre-recorded bird song), and decoys is an increasingly common conservation technique. In general, the songs or calls from individuals of the same species can indicate good habitat and encourage other individuals to settle and breed there too. This technique has been used successfully in North America for over 20 songbird species. Last summer we experimented with audio playback systems at two of our Wildlife Sanctuaries. Read more about that work here. This summer, we are focusing our efforts on Arcadia Wildlife Sanctuary. With over 200 acres of grassland habitat, Arcadia is an important refuge for grassland birds. Eastern Meadowlarks bred in Sanctuary fields in the past, but have not been observed breeding there for three years. 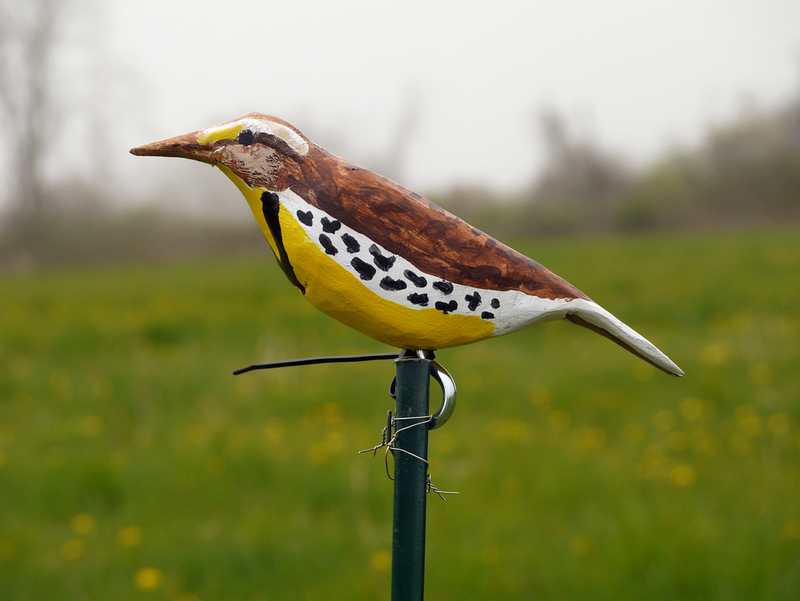 Audio playback systems and decoy meadowlarks have been placed in fields at the Sanctuary and will remain throughout the summer. Keep an eye on this blog for progress updates. Eastern Meadowlark decoys like this have been installed at Arcadia Wildlife Sanctuary this summer, photo by Rosemary Mosco. 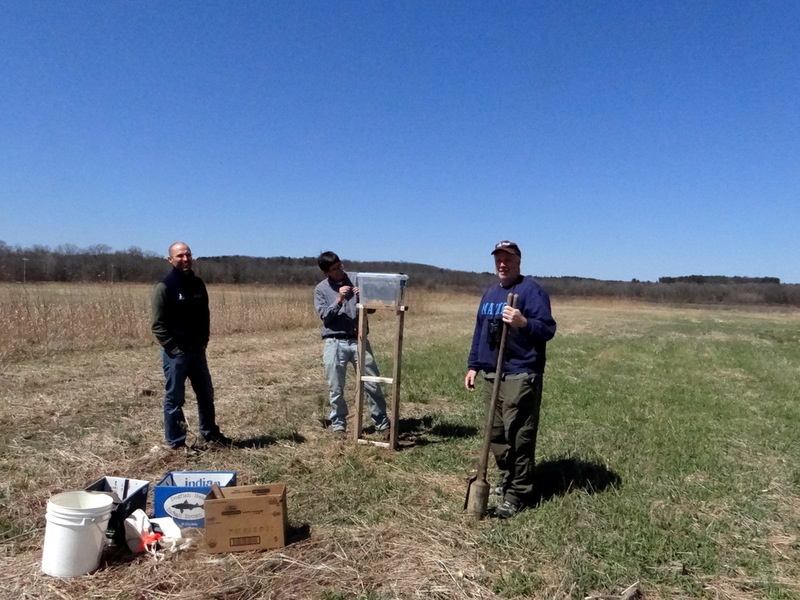 Bird Conservation and Sanctuary Staff installing meadowlark playback equipment into a field at Arcadia Wildlife Sanctuary. This entry was posted in Grassland Birds, Research and Monitoring on April 22, 2016 by Lindall. Bobolinks, and other grassland birds, are facing tough times. Financial pressures force farmers to mow their fields during the weeks that these species are actively nesting. Fortunately, there is a simple–and innovative–way to help. The Bobolink Project “buys time” for grassland birds to successfully nest on working farms by financing bird friendly mowing. The project collects money from conservation donors, and pays farmers who are willing to manage their fields for grassland birds. Learn more about the project. 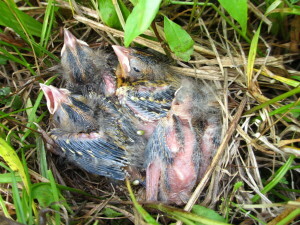 Help protect Bobolink nestlings this summer by donating to The Bobolink Project. Time is running out to protect Bobolinks this season as our deadline to receive donations is April 22. The Project has been so appealing to local farmers that we have over 650 acres submitted. Thanks to the generosity of donors so far, we have enough money to protect over 350 acres of farmland in New England this summer. However, without extra support suitable habitat that has been offered by interested farmers will remain unprotected. Please donate now so that we can cover these extra acres and protect more baby Bobolinks this year! 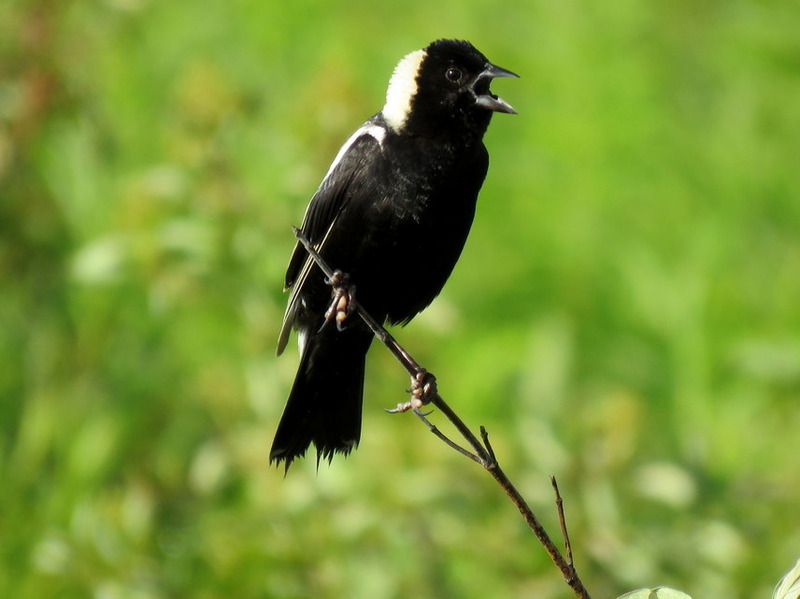 eBird records show that Bobolinks are moving north with recent sightings in Florida. We look forward to welcoming them back to our New England fields. Project leaders have been busily promoting The Bobolink Project in recent months. In Vermont, Mark Labarr and Allan Strong discussed The Bobolink Project on WCAX’s “Across the Fence“. The Project also appeared in the Rutland Herald, and a recent WCAX story featured one of our landowners from 2015! Check out the video. In March, project leaders spread the word at the Connecticut Ornithological Association’s Annual Meeting in Middletown CT, and the Mass Audubon Birders Meeting in Boston MA. Donate, Sign up, like us on Facebook and spread the word to help save our grassland birds! Male Bobolink by Allan Strong. This entry was posted in Grassland Birds on April 13, 2016 by Lindall. The 2016 Birders Meeting took place on March 13 at UMass/Boston, a first-time venue for this always popular yearly event. Nearly 275 attendees – a zenith for the event – were treated to a smorgasbord of talented and engaging speakers including both local talent and others from as far away as California. The theme, Seabirds: Divers and their Drivers, framed the all-day meeting that included presentations ranging from the general to the specific, and from the scientific to the visually stimulating. An opening presentation by artist/author Sophie Webb placed seabirds in a global context by focusing on their diversity, structure, and behavior. David Wiley, researcher from the Stellwagen Bank National Marine Sanctuary, introduced the audience to the variably abundant and somewhat mysterious sand lance, the small baitfish that seasonally sustains so many of the seabirds and marine mammals that regularly inhabit waters in the Gulf of Maine. National Audubon’s Stephen Kress and the Boston Globe’s Derrick Jackson jointly related the remarkable saga of the re-establishment of the Atlantic Puffin as a breeding species to the Gulf of Maine. Following lunch and much enthusiastic spending in a merchandise-rich vendor area, program attendees were treated to a visually stunning array of Peter Flood’s seabird images of species characteristic of the seldom visited continental shelf-edge. The rest of the day’s program offered a series of concurrent presentations by Blair Nikula on the behavior of storm-driven seabirds in Cape Cod Bay; satellite tagging and tracking of Great Shearwaters by Kevin Powers; a primer given by Steve Arena on how to identify seabirds regularly occurring in Massachusetts waters; and citizen science opportunities for people interested in a seabird monitoring project sponsored by the Stellwagen Bank Sanctuary given by Anne-Marie Runfola. An additional highlight of this year’s Birders Meeting was the participation at no charge of nearly 25 young birders made possible by the generous sponsorship of our major sponsor Zeiss. 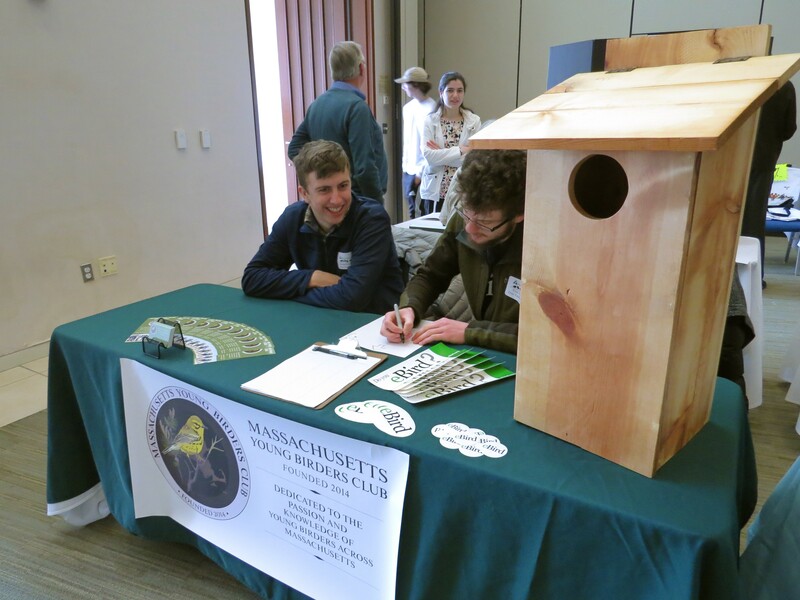 Members of the Massachusetts Young Birders Club (MYBC) were in attendance and able to publicize the club in the vendor area. 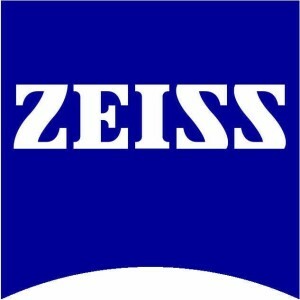 Special thanks to Zeiss for this “investment in the future.” Overall the event was deemed a fine success. We hope that you will join us next year for our 25th Birders Meeting in March 2017! Members of the MYBC, staffing their table in the vendor area. Young birders were able to attend the Birders Meeting free thanks to generous sponsorship from Zeiss. This entry was posted in Events on March 18, 2016 by Lindall. Grassland bird species are in steep decline in Massachusetts, New England, and beyond. 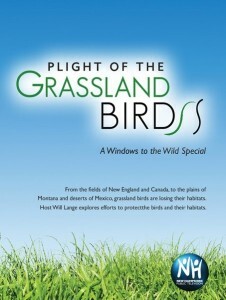 Mass Audubon’s focus on grassland bird conservation, triggered by findings reported in the State of the Birds 2013, includes initiatives to protect birds on working lands. Grasslands in the Northeast have provided home and sanctuary to grassland birds and other wildlife for hundreds of years. The majority of New England’s agricultural acreage consists of privately owned hayfields, so any concerted conservation efforts MUST involve significant participation from farmers and land owners. Agriculture is the only widespread land use that maintains the open land that grassland birds depend upon for breeding. However, financial pressures force farmers to mow their fields during the weeks that birds like Bobolinks are actively nesting. The issue, in terms of grassland bird conservation, is one of timing and economics: birds settle into fields for nesting in May, and farmers typically harvest their first cut in June, when the monetary value of the hay crop is highest. The cutting, raking and bailing of hay typically results in a complete loss of eggs and nestlings, and even breeding adults may be killed. One of the most promising new strategies for conserving grassland birds is The Bobolink Project, which finances bird-friendly mowing practices. There are many hay farmers in New England who are willing to delay their harvest schedule for the sake of nesting grassland birds, but to do so costs money – late season hay is less valuable than early season hay. 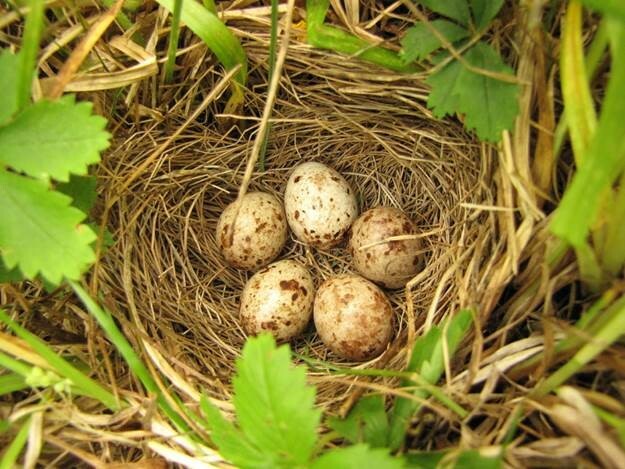 The Bobolink Project “buys time” for grassland birds to successfully nest on working farms by providing financial support, collected from conservation donors, which is paid to farmers who are willing to manage their fields for grassland birds. The Bobolink Project started as a collaborative effort between the University of Vermont and the University of Connecticut; research and administrative costs were initially covered by a U.S. Department of Agriculture grant through the National Institute of Food and Agriculture’s Agriculture and Food Research Initiative. The main focus of The Project was the Champlain Valley in Vermont. 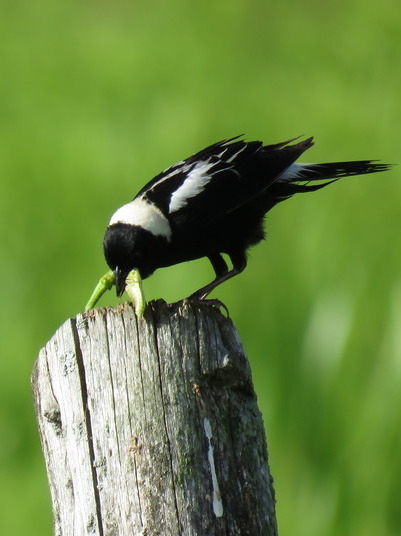 In 2015, approximately 550 young fledged from fields enrolled in The Bobolink Project. These hayfields also supported other declining grassland bird species such as Savannah Sparrows, Eastern Meadowlarks and Northern Harriers. The Project was so successful that founders, participants and contributors wanted The Bobolink Project to continue despite the ending of federal funding at the end of 2015. All was in jeopardy until Mass Audubon joined forces with Audubon Vermont and Audubon Connecticut, and took on administrative and oversight responsibilities. The Bobolink Project is now collaboratively coordinated by Mass Audubon Bird Conservation staff and our Audubon partners, with The Project’s founders still supporting the effort. We are expanding the geographic range of The Project and can only succeed with your support. We need the cooperation of both farmers and donors by April 22. Pass this information to your friends, farmers or donors, and ask them to tell their friends too! Help protect Bobolinks by donating to The Bobolink Project. Photo by Allan Strong. This entry was posted in Grassland Birds on March 17, 2016 by Lindall. Birders Meeting- Early Bird Registration Closing! 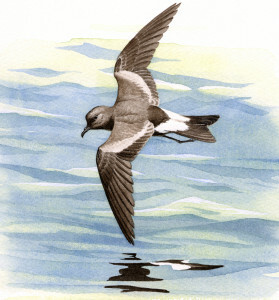 Leach’s Storm-petrel by Jon Sill. 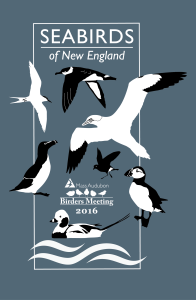 Mass Audubon’s 24th Birders Meeting is taking place on March 13th at UMass Boston. Tickets are selling fast! Early Bird prices run until February 28, so register soon to save $10. The theme of the meeting is Seabirds: Divers and Their Drivers. The program will focus on seabirds and their remarkable characteristics, adaptations, behaviors, and varied forms and functions. A star-studded lineup of speakers will include keynote speaker, Dr. David Wingate (savior of the Bermuda Petrel), in addition to Dr. Steven Kress and Derrick Jackson (restoration of the Atlantic Puffin in the Gulf of Maine), and Sophie Webb (acclaimed artist and author). Other speakers will discuss seabird identification techniques and research and monitoring efforts right here in Massachusetts. Don’t miss out – Register Now! Our friends at The Connecticut Ornithological Association (COA) are hosting an event on Saturday the 19th of March in Middletown, CT. The 32nd Annual Meeting is a great opportunity to join CT’s birding community and spend the day learning from speakers including: Brad Winn “Understanding Shorebird Migration to Help Direct Conservation Action”, Neil Hayward “An Accidental Big Year” and Cameron Cox “Seawatching: The Identification of Waterbirds in Flight”. Visit the COA website for more information. This entry was posted in Events on February 24, 2016 by Lindall. Vern Laux,1955-2016. Thanks to Lanny McDowell for providing this photo. 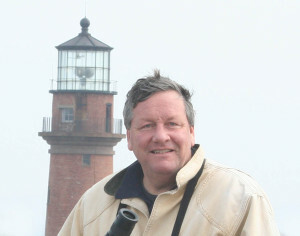 Both the world and the birding community lost a superstar to cancer with the passing of Vern Laux on Nantucket last month. Vern Laux was at once a newspaper columnist, a radio personality, an author, an educator, a tour leader, a master birder, a champion of birding and bird conservation, and a larger than life personality. Like a little boy in a giant’s body, through the years Vern’s infectious enthusiasm for people, birds, and birding never ceased to afford him a devoted following. From his youthful days running birding trips on the outer beaches of Cape Cod for Wellfleet Bay Wildlife Sanctuary and driving zodiacs for cruise ships in Antarctica, to routinely making stunning birding discoveries like finding the first North American record of Red-footed Falcon on Martha’s Vineyard in 2004, and more recently establishing and organizing the Nantucket Birding Festival for the Linda Loring Nature Foundation, Vern always had an enthusiastic following and was usually at the head of the line. Always outgoing, willing, and uniquely able to share his vast knowledge of birds with any and all who were interested (and even some that may not have been! ), Vern was a virtual Pied Piper, and more than once overheard comments included remarks like, “See that big guy over there with the red knit cap on. 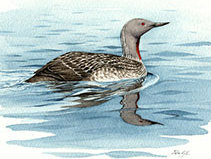 He is both a hoot and a truly amazing birder!”, or “Vern must be bionic! How did he ever spot that bird?” To see Vern Laux at his best was to stand atop the Aquinnah cliffs on Martha’s Vineyard at first light and watch and listen as he reeled off the names of tiny migrant birds in flight by both sight and sound at seemingly any distance, or to listen as he described with Howard Cosell- like precision and humor the pursuit of a tiny warbler by a streaking Merlin. Vern could hear, see, and describe to others things that seemingly no one else around him could – he was truly a master of his craft. Thanks in no small part to an outstanding junior high school science teacher that he encountered while growing up in Wellesley, he was early on captivated by birds – an interest he maintained with a passion for the rest of his life. To all (and there are many) who came in contact with him, or were touched by his zest for life, he will forever go down as “one of the great ones,” and he will surely be missed by all who were fortunate to know him. This entry was posted in Uncategorized on February 4, 2016 by Lindall. Dr Jon Atwood recently moderated a showing of New Hampshire Public Television’s Plight of the Grassland Birds film in Keene, NH. The showing was co-sponsored by the Harris Center for Conservation Education, the Monadnock Conservancy, and Keene State College. The event was well attended with over 50 people in the audience. Attendees consisted not only of birders and conservationists, but also members of the farming community of southwest New Hampshire. Jon described Mass Audubon’s current work aimed at supporting The Bobolink Project’s efforts to connect conservation donors with farmers willing to delay their harvesting schedules for the sake of nesting grassland birds. This entry was posted in Events, Grassland Birds on January 29, 2016 by Lindall.